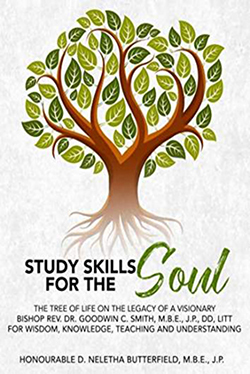 Educator and author, Neletha Butterfield has produced her sixth book entitled “Study Skills for the Soul” with the new book due to be released on Sunday [Nov 25]. A spokesperson said, “Educator and author, the Honourable D. Neletha Butterfield, M.B.E., J.P., has produced her sixth book entitled “Study Skills for the Soul”. This study skills book will be released on Sunday, 25th November, 2018 after the morning worship service at the New Testament Church of God – Heritage Worship Centre. “Bishop Lloyd E. Duncan, Administrative Bishop said that it will be a time of reflection and thanks for the outstanding work of the late Bishop Goodwin Smith who gave of his spiritual service to his country and community. “We will recall and reflect on the tremendous service he gave to the church and those whose lives he touched through counselling, prayer, teachings and direction are invited to join us on Sunday morning. “Hon. Butterfield states that it is with the hopes and belief that not only members of the New Testament Church of God would utilize the study skills book but the community. In this study skills book there are questions and answers that would assist you in learning more about Bishop Smith and the great contribution he made to his family, his church and his community. “The study skills book is meant to serve as a historical document and an easy way to read a chapter at a time and answer the questions. The Tree of Life is first spoken of in Genesis 2:9 and reads: “In the middle of the garden were the tree of life and the tree of the knowledge of good and evil.” God wants the best of us and wants us to make good choices. “The tree of life reminds us too that we can and Bishop Smith reminded us that we can choose a fruitful and rewarding life. “In her book “The Legacy of the Visionary”, Dr. Lois Smith-Burgess, friend and author captured the life and legacy of the late Bishop Dr. Reverend Goodwin C. Smith, M.B.E., J.P., D.D. LTTT. Her book highlights his growing up early years, a life transformed, the birth of the vision, the winds of change and a legacy of hope to name a few of the chapters in her book. “Her book has now been complimented with the book Study Skills for the Soul.